Oil on canvas, 43 x 32 cm. A milkmaid walks along a winding path amidst a dense forest. 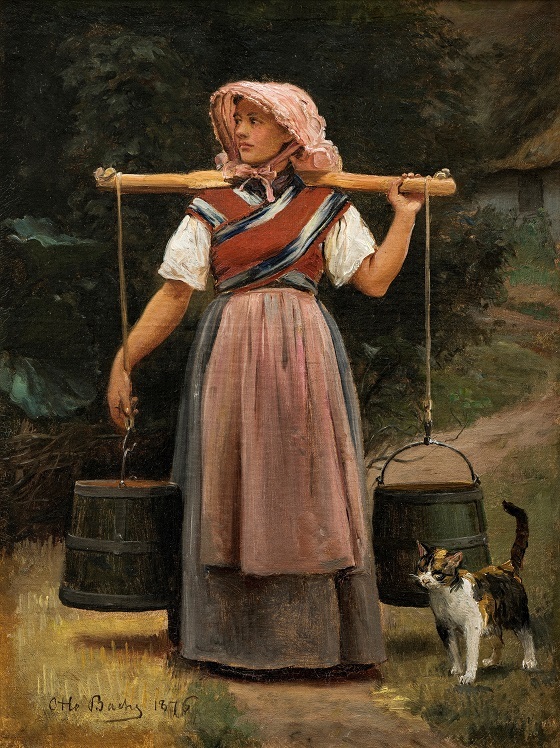 She carries a yoke over her neck and shoulders with two buckets of milk. Drawn by the milk, a cat has followed her on her trip from the farm, which can be seen in the background. In addition to his many genre paintings dedicated to life in Copenhagen, Otto Bache also painted numerous National Romanticist paintings of life in the countryside. Although farm animals often occupy a prominent position in Bache’s depictions of everyday life in the countryside, he also took an interest in the life and labour of the Danish peasant. In this painting it is not the cat, but the hard-working milkmaid who occupies the central position in its composition. The Danish painter Otto Bache’s early oeuvre is marked by National Romanticist depictions of peasant life, but it is particularly his later mastery of portrait painting, history painting and animal painting that earned him a place in Danish art history. Bache was admitted to the Danish Royal Academy of Art in Copenhagen when he was just 10. He would be connected to the academy his whole life, first as a student and later as a professor and its director. His style was influenced by the academic, detail-packed naturalism introduced by Eckersberg, but his encounter with modernism’s new trends in Paris had a major influence on Bache’s choice of colours, depiction of light and choice of subject. Bache was the first to import this new and French approach to painting to Denmark around 1870, but in contrast to his contemporaries Krøyer and Philipsen, Bache remained more loyal to the traditional school of painting. This made him popular in certain conservative circles such as the Royal Family, to which Bache delivered numerous portraits and historical paintings. However, this also resulted in Bache often being something of an overlooked figure in Danish art history.